The Leather Basic is a leather encased flash drive with a chrome body. It has a unique sliding cap that won't get lost and continues its classy, masculine look. Works well for a variety of businesses looking to expand their branding horizons. 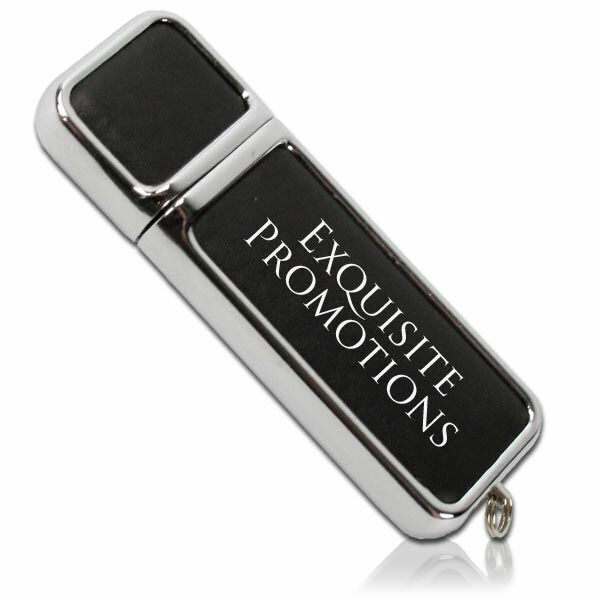 Our available heat stamp imprinting is sure to leave an impression on your customers with this suave promotional USB drive. When your clientele doesn’t typically go for fancy, modern lines and contemporary aesthetic, the Leather Basic will be there waiting. It combines metal and leather in a classic memory stick shape. It offers a good size print space that can be leather embossed or silkscreen printed, whichever suits your purpose better. It has updated performance, however, with high speed connection and wide compatibility with operating systems. The protective cap matches the drive body. It looks, feels, and performs like old fashioned quality construction.